Are you looking to improve your golf swing and game? Pilates training will help you hit the ball farther, straighter and more accurately with less chance of injury. Golf requires muscular strength, joint flexibility, neuromuscular training and the perfect balance between mobility and stability. The golf swing is a coordinated movement that on the moment of impact applies compressive forces of approximately eight times one’s body weight. Spinal alignment is vital to proper swing mechanics, since the spine coils and uncoils 100-130 times in one direction over an average 4-hour game. Is Your Body Prepared For the Game of Golf? Golf is a game of asymmetry and multidirectional stresses. To improve in golf, players need a golf training program that will produce the greatest results in the most efficient amount of time. Golf injuries are caused by the instability of the golfer to maintain proper spine angle in the swing putting more stress on other muscle groups besides the back. The knees, hips, forearms and shoulders are often subjected to extra stress to compensate for lack of core abilities. For the most part, golf and Pilates are mind-body activities that share the same basic principles requiring flexibility, rotation and core strength. Pilates movements are based from the center of the body, as are most shots in golf. Pilates spinal rotation exercises de-rotate the spinal imbalance and realign core muscles. Clients start to think about the body and its functions differently when they take Pilates. They think about the core (trunk, shoulder girdles and pelvis). Strengthening and creating flexibility through specific exercises in these areas will help balance the muscles around a joint and balance pairs of muscles that support the joints. Pilates training will allow the transference of power to the legs, trunk and arms. Addressing physical limitations through a series of Pilates exercises can help create symmetry and coordination, improve muscular endurance and increase range of motion. Everything that is learned in the studio is transferred directly onto the course. Postural alignment is key. This will help the golfer perform the swing more efficiently and reduce the amount of unnecessary strain on the muscles and joints. Pilates is the Ideal Golfing Partner. 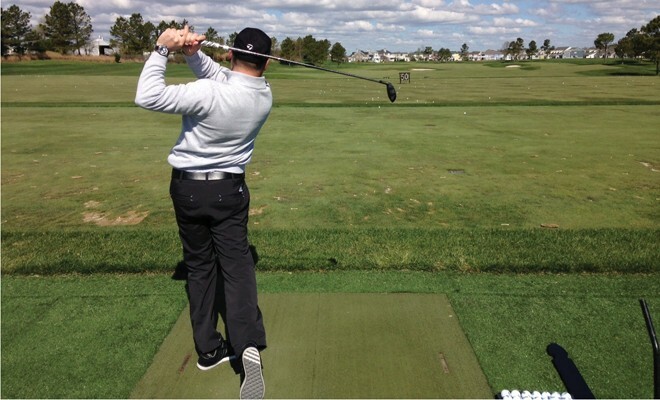 Phil Ortiz, Golf Pro at the Peninsula Club in Long Neck DE, says the most common thing he sees on the course is lack of hip rotation. He trains his clients to create “power” from knees to hips and “timing” from the upper body. This connection needs to be supple. Correcting the golf swing at the time of the swing will not improve the physical cause. He explains golf like “life” . You have to prepare, create the action and, most important, follow through. One must complete all for success. 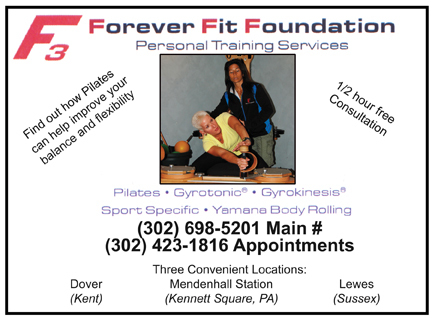 A Forever Fit Foundation Pilates instructor can help improve underlying limitations that need to be addressed at their physical source. The body needs to be retrained in order to improve the swing, prevent the risk of injury and increase overall performance. During a Pilates session, the golfer will experience full body exercise that works all muscles and is easy on the joints. A stronger and more stable core will make the body more flexible and symmetrically balanced. All of the changes from Pilates training will help the golfer drive the ball farther and avoid the “sand trap” of fatigue and injury. Call today to set up an appointment! ← Previous Story The Obstacle Is YOU!